Whilst fresh, ripe apricots are a metaphor for summer, I couldn’t wait to bring the clocks forward by making this very useful, springtime Almond Apricot & Lemon Cake. 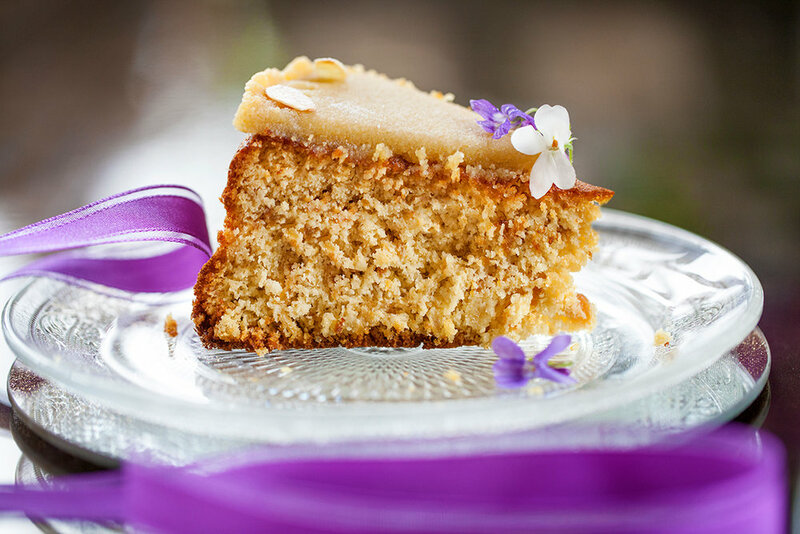 All light and lovely - almonds and apricots are a fabulous pairing - I decorated my cake with a top layer of no-sugar almond paste and fresh wild violets from the garden in readiness for an Easter Sunday teatime treat. The fact is, I’m not brilliant at cake decorating, so homemade almond paste, edible flowers, which smell divine by the way, and a pretty ribbon does the job. The result is a really moist, light, golden cake studded with small pieces of fruit, which isn’t a million miles away from traditional Simnel cake, but looks prettier. Gorgeous as this cake is, if you want something less fussy, simply top with a sifting of icing sugar and serve with coffee or, better still, mint tea. You can also try your own homemade Lavender Mint Tea. The cake is then easily transformed into an ‘after dinner’ dessert by serving with poached apricots, rhubarb, plums or pears. Or you can substitute an orange for the lemon in the recipe and serve with a fresh orange salad and whipped cream. In my imagination, the cake eating possibilities for this simple, delicious cake are endless. Easy to make, it keeps like a dream. Wash the lemon, then put it in a small saucepan and cover with cold water. Bring to the boil and simmer gently until soft (about 45 minutes). Take off the heat, add the dried apricots to the pan. Leave to cool. Grease a loose-based 8” cake tin (preferably springform) and line the sides and base with non-stick baking parchment. Pre-heat the oven to 150℃ / 300℉ / Gas mark 2. Drain the lemon and apricots. Cut the lemon into quarters and remove any pips. Dry the apricots on kitchen paper then cut each one into several pieces. Put the lemon quarters and apricots into a food processor or blender and whizz together until very finely chopped into almost - but not quite - a smooth puree i.e. it needs to retain some texture. Using an electric whisk, whisk the eggs, honey and Sukrin:1 together for about 6 to 8 minutes until they are pale and thick and until the mixture holds its shape for a few seconds when it’s flicked across the surface of the rest of the mix. Whisk in the lemon and apricot puree. Then, using a large metal spoon or rubber spatula, gently fold in the ground almonds. Pour into the prepared tin and bake for 1¼ hours, or until a cocktail stick inserted into the centre of the cake comes out clean. N.B. To prevent the cake from getting too brown, cover the top of the cake lightly with a circle of non-stick baking parchment after the first 45 minutes baking time. After you take the cake from the oven, leave it to cool completely in the tin, then turn out carefully and remove the paper. Dust the cake with Sukrin Icing just prior to serving. Put the ground almonds, Sukrin Gold and Sukrin Icing into a food processor and pulse to combine. Add the egg yolk, lemon juice and 1 teaspoon of maple syrup and process until a soft, dry paste forms (takes about 1 minute). If it doesn’t come together into a malleable paste (test by squeezing a little of the mixture between two fingers to see if it holds together), add another teaspoon of maple syrup and whizz again. It’s a fine balance. The longer you process the almonds the more oil is released, which helps bind the mixture together. However, it you over-process it, the paste becomes too oily and sticky to handle. Form the almond paste into a ball then place between two sheets of cling film or baking parchment. Flatten slightly with the palm of your hand, then roll out evenly into an 8 inch (20 cm) circle. N.B. You can either draw a circle on the back of the bottom sheet of baking parchment to guide you or use a cake tin liner placed under the bottom sheet of cling film. Invert the cake onto a serving plate so that the bottom side of the cake becomes the top i.e. you have a completely flat surface to work on. Heat the jam slightly in a small saucepan and brush it over the top of the cake. 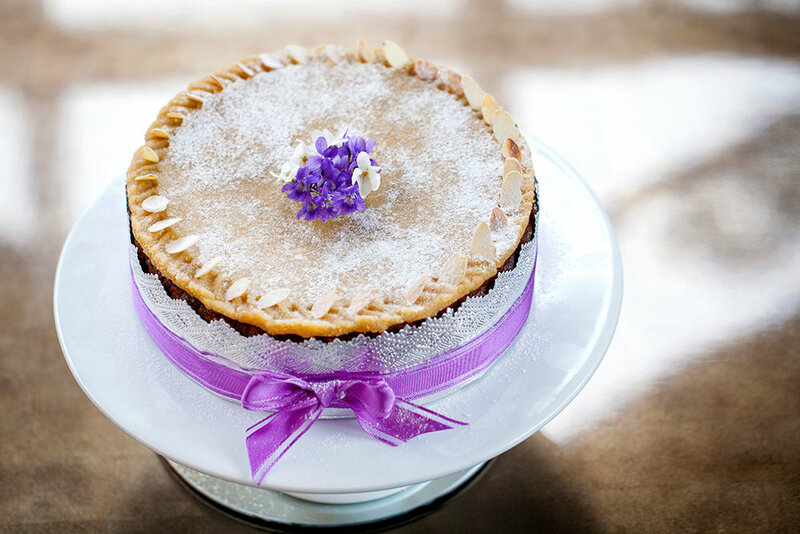 Remove the top sheet of parchment or cling film from the rolled out circle of almond paste, then with the help of the paper or cling film still underneath, lift the almond paste onto the top of the cake. Press down lightly with your hands, then peel away the remaining paper/cling film. Crimp the edge of the almond paste with your fingers or alternatively create a pattern around the top edge of the cake by light indenting with the prongs of a fork or wooden skewer. Decorate with organic edible flowers, toasted flaked almonds and a matching ribbon (see photo). Just prior to serving, sift a little Sukrin Icing over the top of the cake. I’m not cut out to be a landlady. I used to think that renting out property in an era of low interest rates would be a savvy way to create a retirement income. I’ve changed my mind. Firstly, I don’t get to retire because owning rental property isn’t so much an investment as a business. Secondly, the reason there aren’t many, if any, beautiful, immaculately maintained houses ‘To Let’ is because the majority of tenants, no matter how well you vet them, will trash rental property rather than treat it as their own. Worse still, in our namby pamby society legal ‘rights’ favours the tenant over the landlord, so if your ex tenant is willing to lie through their teeth to avoid paying for the damage they’ve caused, you’re forced into a dispute that takes weeks of wearisome effort pulling all the evidence together in order to prove your loss. It’s such stuff and nonsense that has kept me from posting Primal Plate recipes for the past couple of months. The good news is that I’ve finally been afforded some time and respite to get my blog back on track before seeing my ex-tenants in court! And, on a happier note, we’ve now appointed Sarah to be the sole custodian of a fabulously refurbished property. Lucky, lucky girl! Accordingly, this wonderfully tasty, nutritious carrot cake made its star debut at a family get-together last week to celebrate Sarah moving to her new home, to mark a milestone birthday, to wish “bon voyage” to someone special fulfilling his lifetime ambition to visit Australia and not least for me to honour some creative time back in the kitchen. Everyone unanimously agreed that it was “The best cake you’ve ever made!” I concur. Enhanced by orange zest and warming spices, Celebration Carrot Cake has an autumnal feel that’s made extra special with the most delicious Cream Cheese Frosting and Caramelised Pecans. With more than a passing nod to the 1960’s, Primal Plate’s Celebration Carrot Cake is an updated, healthy version of classic carrot cake. It’s the perfect expression of all that I love about eating Primal. A delicious, seemingly indulgent cake that’s impossible to resist but with no grains, no gluten, no refined sugar and less carbs than a small banana! For the sweet-toothed and health conscious, I think that’s something to celebrate in its own right. In a small saucepan over a low heat melt the butter (or coconut oil) and maple syrup together. Take off heat and allow to cool for 5 minutes. In a separate bowl, with an electric whisk, beat together the eggs, vanilla extract & melted butter/maple syrup mix until frothy and well combined. Cool in their tins for two hours before turning out onto a wire cooling tray and removing the paper discs. Beat the cream cheese, maple syrup, vanilla essence, Sukrin icing sugar together in a large bowl with a handheld electric whisk until well combined and light and fluffy. In a separate bowl, whip the double cream until it stands in medium peaks. N.B. Don’t over whisk your cream at this stage because it will solidify even more when you try to incorporate it into the cream cheese mixture, which means you might end up with lumpy rather than smooth cream cheese frosting. With a rubber spatula, gently fold the whipped cream into the cream cheese mixture until evenly combined. Heat a small non stick frying pan over a medium-low heat. Add the coconut oil, maple syrup and pecans to the pan (in a single layer) and cook for 4-5 minutes, stirring and turning the nuts over occasionally, until caramelised and golden. Turn onto a plate to cool. Transfer one of the sandwich cakes onto a serving plate or cake stand. Spread one half of the Cream Cheese Frosting on top and using a flexible metal spatula level out to just within the outermost edges to create the sandwich cake filling. Place the second sandwich cake directly on top of the first cake. Dollop the remaining half of Cream Cheese Frosting on top, spreading it out evenly before gently swirling the surface into a simple, decorative-looking finish.